This mountain top chalet is the perfect vacation home for outdoor enthusiasts, families, or those just looking for a quiet, relaxing escape. Beautiful and serene sitting at 2,300 ft, this unique home and its surrounding area truly provide something for everyone. 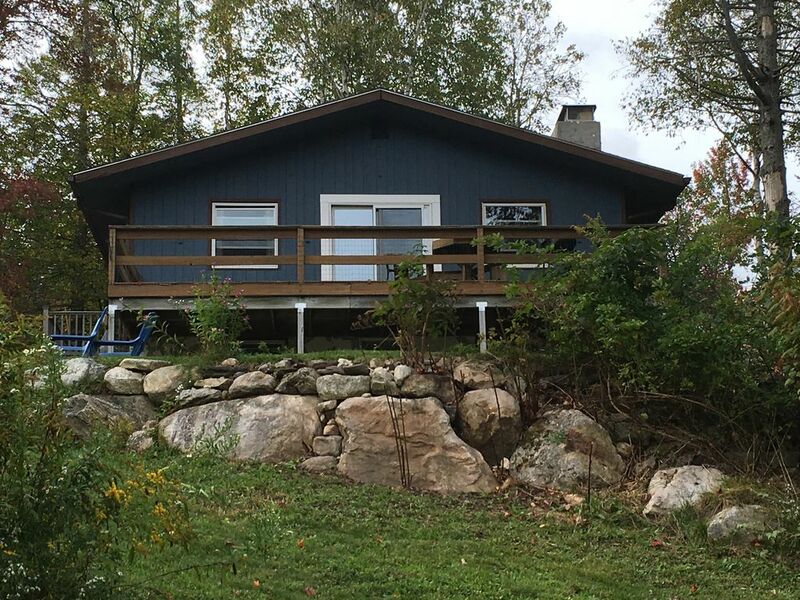 This house sits right next to the Green Mountain National Forest and includes access to incredible hiking, mountain biking, XC & back country skiing, sledding, and snowmobiling trails right from the front door. Just a couple minute drive will take you to some of the best trails (including the Long Trail) and state parks Vermont has to offer. This home is located off a private road with easy access to XC Ski resort, Prospect Mountain, and under an hour drive to Mt Snow, Stratton and Bromley for Alpine skiing. Woodford also offers some of the greatest hunting opportunities in Vermont. 15 minutes to historic Bennington and Wilmington, and 40 minutes to additional dining and amazing outlet shopping in Manchester. The house offers two floors with entrances on each level. The upstairs features a fully equipped eat-in kitchen, a living room with a wood stove and a sliding glass door leading out to a large deck with breathtaking views of Prospect Mountain. Off the living room is an attached dining room. There is also a full bathroom upstairs and a bedroom with a queen sized bed. The downstairs contains a full bathroom, bedroom with full sized bed, an additional lounge with fireplace and a den. The house has additional sleeping areas on both levels and sleeps up to 8. Other amenities include large deck, stackable washer/dryer, linens provided, DVD/VCR player, cable TV, WI-FI, piano, fire-pit, fireplace, woodstove, outdoor grill, darts, pets welcome, no smoking, sleeps up to 6-8. This is a beautiful location with something for everyone. Lots of things to do outdoors and plenty of fall and winter activities! The sun rises right over Prospect Mountain which you can enjoy every morning from the deck. When the sun sets Prospect Mountain glows! The moon will rise over the mountain, which is incredible when the moon is full! We thoroughly enjoyed our 5 day stay at this cottage. It is comfortable, neat, very clean and extremely well equipped. The kitchen was very well equipped, as were the linens and cleaning supplies. It has wonderful views of the mountain. The thermostat was a little wonky at first (which the owners stated on their list for renters in the kitchen) but my husband realized the clock on it was just off on the time. Once he fixed that it was perfect. The downstairs is perfect for another couple or for teenagers. Very easy access to Bennington. The woodstove added to the ambience. We would definitely stay here again and would like to explore the area more than we did. Thank you to the owners! The cabin was very comfortable, cozy and fully equipped. The upstairs was perfect for a couple. The view out the back towards the pond and the snow covered trees was spectacular. We would definitely return. Cozy Vermont Cabin in the Mountains! Great property, wonderful host, we will be back again for sure! this house was exactly as promised. We spent the morning down by the pond with the sun coming up drinking coffee. Up late by the fire. Low key. Realy close to some nice lakes and hikes. dogs loved swimming. Neighbors were friendly and didnt mind the dogs running around. Was just what we needed. This home is located off a private road with easy access to XC Ski resort, Prospect Mountain, and under an hour drive to Mt Snow, Stratton and Bromley for Alpine skiing. Woodford also offers some of the greatest hunting opportunities in Vermont. Just a couple minutes drive will take you to some of the best trails in Southern Vermont including easy access to the Long Trail/Appalachian Trail. Drive 5 minutes down the road to visit Woodford State Park where you can hike around the lake, enjoy the local beach, kayak, canoe and take a dip in the refreshing waters of Woodford Lake. Holiday Pricing may vary, please inquire.